As I write this, I’m very aware that I need to post a reflection on my visit to Maker Faire, as I learned about so many new tools and ideas while continuing to come up with ideas of how to use existing things in my classroom. This post is meant as a reflection for my LEC course I’m taking right now, thinking about social networks and how they support me as a learner and professional. 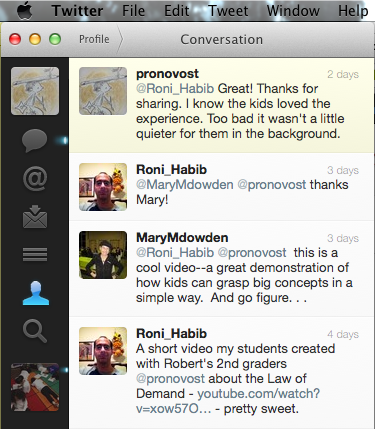 This image, a screenshot of a conversation on Twitter, shows the results of a collaboration between my class and Mr. Habib’s class (@Roni_Habib) during this past month. Roni and I met at the CUE Conference in Palm Springs in March, even though our schools are less than 10 miles apart in the Bay Area. Through Twitter, Roni asked if my class would be able to participate in a project for his Economics class, to which I enthusiastically (well, I remember it this way) said yes. We coordinated through Twitter and email to make it possible, resulting in some of his students coming over to our classroom and working with M&Ms and Tootsie Pops to understand the laws of economics. While this would have still been possible without Twitter, the ease of communicating and the limits it forces via character limitations made this project more possible than it would have been without. Perhaps this would’ve been possible with another form of social media. I don’t know, since for me, Twitter is the only one that has really lent itself to becoming a learning/communication tool. Other social media has become a place where I can share or I can see what others have shared, but it feels much more shallow than my interactions on Twitter. Since I mostly follow education-related people/companies on Twitter, I am getting a constant stream of amazing resources and ideas. This can be very helpful, because I get to keep up to date and get to learn A LOT everyday, but it can also distract me from keeping a focus. Perhaps I get online, hoping to connect over a relevant #edchat for an hour, but during that hour I also learn about ten other new things. I can “favorite” the posts for later, but that “favorites” backlog is now over 700 messages long and sometimes those new things feel more immediately relevant. Two hours later and I’ve done no work, but am up to date on the International Space Station and know the ins-and-outs of PicMonkey. I can see students facing the same distraction factors, even more if they haven’t effectively filtered their incoming information. I can’t use Facebook as a learning tool personally, because I have too much incoming information already. I’m sure I could put in some filters to that information, but since I don’t see Facebook as a learning tool for myself, it’s not worth the effort. For whatever tool my students are going to use for learning, they need to learn how to use that tool effectively. I can and will support them by modeling my effective use of social media both inside and outside the classroom. We will try using the social media tool effectively in a class discussion or exploration in order to be able to reflect on the use as a class. Class reflections will be the most important part, in fact, because that is the time that we will truly be able to actually digest the ways that social media can help and hinder our learning. This entry was posted in Leading Edge Certification course and tagged CUE, Facebook, Roni_Habib, social media, Twitter. Bookmark the permalink.